National Ask An Atheist Day, on September 20, is an opportunity for secular people and organizations across the country to work together to defeat stereotypes about atheism and encourage courteous dialogue between believers and nonbelievers alike. 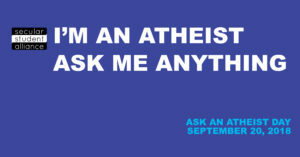 Ask An Atheist Day is intended to be an opportunity for the general public—particularly people of faith—to approach non-theists and ask questions about secular life. We encourage you to participate and host your own Ask An Atheist Day event! More information and resources are available here. I have always been curious as to whether or not atheists ever ask themselves the question: What if I am wrong? What if there is a God, salvation, and eternal life? You will not find this out until you die, and then it is too late. What do atheists believe happen to them when they die?